Pundarika Vidyanidhi’s father was named Baneshvara and his mother, Ganga Devi. He was born on Vasanta-panchami, the fifth day of the waxing moon in the month of Magh in Chakrashala in Chittagong. His home, or Shripat, used to stand in the village of Mekhala which is two miles east of the Hat Hajari police station, about twelve miles north of the city of Chittagong. Vidyanidhi’s father was a Varendra Brahmin who hailed from the town of Baghiya in the district of Dhaka. Pundarika Vidyanidhi himself was a wealthy zamindar of Chakrashala. Shri Pundarika Vidyanidhi came to Navadwip because he wished to live by the banks of the Ganges. Mahaprabhu, the indweller of all beings, knew prior to his coming that he had such a desire, and one day in the assembly of Devotees started calling out, "Pundarika, My friend, My father!" and crying. When His associates asked Him why He was crying in this way, the Lord described Pundarika Vidyanidhi to them in the following way: "His character is quite extraordinary. Just by hearing his name, the whole world is purified, but he dresses and looks just like a materialistic person in the midst of the accouterments of the life of pleasure. No one is able to recognize him as a Vaishnava, yet he remains constantly merged in the deep ocean of devotion for Krishna. He never bathes in the Ganges because he is afraid to touch the holy waters with his feet, which would show disrespect. He only goes to take darshan of the Ganges at night and from a distance. He cannot bear to see people engaged in offensive behavior to the Ganges by gargling, cleaning their teeth, washing their hair in her waters, so he never goes there during the daytime. He never engages in worship of the Deity without having taken a drink of Ganges water. He has homes in both Chittagong and in Navadwip and will soon be arriving here. Because of his apparently materialistic behavior, you will not be able to recognize him, but I feel unwell because I am not able to see him." Shrila Gadadhara Pandit Goswami, Mukunda Datta and Vasudeva Datta were also originally from Chittagong and so they were acquainted with Pundarika Vidyanidhi. Indeed Gadadhar Pandit’s father Madhava Mishra was his good friend. Mukunda Datta knew his transcendental personality and that he was a Vaishnava, but Gadadhara did not, even though he was from the same town. This was, of course, a pretense for the sake of the lila. When Pundarika was living in Navadwip, Mukunda Datta told Gadadhar one day that he wanted to introduce him to a great Vaishnava. Shrila Gadadhara Pandit Goswami was a brahmachari from childhood and extremely detached from the senses and ascetic in his lifestyle. When he saw Pundarika sitting on comfortable cushions covered in sheets as white as the foam of milk, and wearing very expensive clothes and perfumes, smoking from a hookah, and generally surrounded by all the trappings of a sensual lifestyle, he was unable to recognize him as a Vaishnava. Indeed, he felt let down. Mukunda could see from Gadadhara’s face what was going through his head, and in order to bring out Pundarika’s inner mood, recited two verses from the Bhagavatam that enkindle the flames of love for Krishna. How truly amazing! The sister of Bakasura, the evil Putana, was sent on a mission to kill Krishna. He drank the kalakuta poison mixed with her breast milk, and despite her evil intentions, awarded her the position of a wet nurse (as Ambika Killimba in Goloka). Who is more merciful than He that I should take shelter of Him? That Rakshasi Putana was a blood-drinking killer of infants. Even though she wanted to kill Krishna, because she gave Him her breast, she attained the auspicious goal of a nurse in Goloka. As soon as he heard these two verses in glorification of Krishna’s mercy, Shri Pundarika Vidyanidhi cried out "Ha Krishna!" and fell to the floor in a swoon. He began to roll on the floor in ecstasy, knocking over the hookah and tearing his clothes. When he saw these transcendental symptoms of love on Pundarika’s body, Gadadhara realized that he had committed an offense, which he began to regret. He decided that the only way to rid himself of this offense would be to take initiation from Pundarika, and he related this idea to Mukunda. Mukunda then communicated his desire to Pundarika who happily set a date for the auspicious act. Mahaprabhu also gave His approval and so Gadadhara took mantra initiation from Pundarika Vidyanidhi. In Krishna lila, Shri Pundarika Vidyanidhi is Vrishabhanu and Shrila Gadadhara Pandit Goswami is Radha. Because of his identity as Vrishabhanu, Mahaprabhu would call out to him as "father!" when He was Himself in the mood of Shrimati Radharani. The deep affection from their previous life’s relation became apparent between Pundarika and Gadadhara. No one can understand the pastimes of the Vaishnavas without their mercy. Even the gods are unable to recognize a Vaishnava, so how can a foolish, fallen child like Myself do so? Even though Pundarika Vidyanidhi was a great Vaishnava, he kept it a secret and appeared just like a materialistic person. One cannot recognize a Vaishnava through any superficial examination. Shrila Bhaktisiddhanta Saraswati Goswami Thakur writes in his Gaudiya-bhashya to the Chaitanya Bhagavat: "Krishna lila is not accessible to pure sensual understanding. Krishna’s servants occasionally go unrecognized due to their apparently materialistic surroundings. In this way they deceive the conditioned souls. Most scholars take Krishna’s activities to be those of a material lover because of their own obsession with sensuality, and thus they have no faith in Him. Others consider Krishna to be an ordinary man who is born and dies and is transformed and thus they have no idea of who He really is. Krishna’s Devotees are also sometimes reluctant to reveal their real selves to those who are unworthy and thus make a pretense of being ordinary materialistic persons. Gauranga Mahaprabhu is also sometimes called the pracchanna-avatar or hidden incarnation. In the same spirit, Pundarika put on the show of being sensualist for those who were capable of being deceived by someone’s external appearance." One day Pundarika Vidyanidhi came to see Mahaprabhu when it was already quite late at night. As soon as he saw the Lord, he was so overcome by love that he could not even pay his obeisances. Mahaprabhu was similarly anxious to see His most dear Devotee, Pundarika and He immediately took him to his breast and washed Him with his tears of love. When the other Devotees heard Mahaprabhu cry and call Pundarika "father" and "treasure of love", they knew that he was most dear to Him. 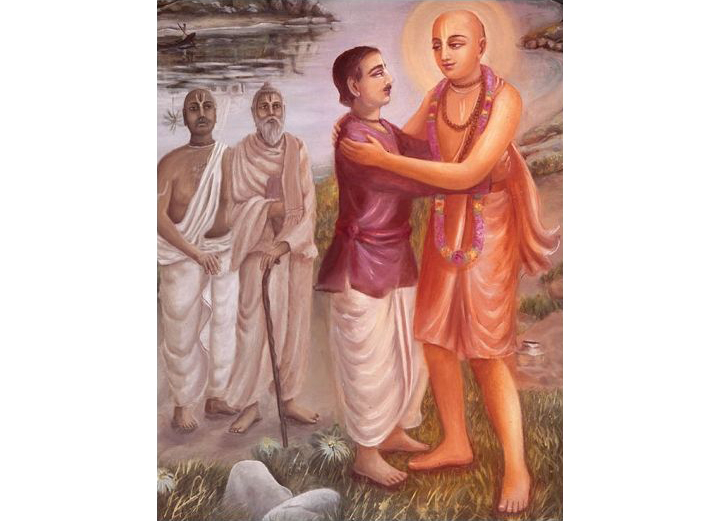 Pundarika Vidyanidhi was also known to Mahaprabhu’s associates as Acharyanidhi. Shri Pundarika Vidyanidhi was also present at Jagannath’s Chandana yatra festival when Mahaprabhu and all His Devotees would play in the water of Narendra Sarovara, also known as Chandan Pukur. Pundarika and Svarupa Damodar were close friends and they joyfully splashed each other as a part of these pastimes. Pundarika Vidyanidhi also participated with Mahaprabhu and His associates in the cleaning of the Gundicha Temple, afterwards relishing Mahaprasad with them. "Ever since I repeated my ishta-mantra to someone, I have been unable to concentrate when I chant. Please repeat the mantra to me, then my mind will be calmed." Gadadhara answered, saying, "He isn’t here. Please do it in his place." Mahaprabhu replied: "Destiny will bring your guru Vidyanidhi to you." The omniscient Mahaprabhu continued, "Shri Pundarika Vidyanidhi will be here in Puri to see Me in ten days." And that is what came to pass. Mahaprabhu became ecstatic, crying, "Father has come! Father has come!" Upon Vidyanidhi’s arrival, Gadadhara went to him and asked him to repeat the mantra to him. Our most worshipable Shrila Prabhupada commented on the above verse (3.10.24) in the following way: "The mantra is that divine sound or shabda brahma which destroys the mental aptitude for sense gratification. If one instructs a faithless person in the divine sound, the mind becomes contaminated. If one’s divine understanding (divya-jïana) is destroyed, then one must seek the same again. Gadadhara Pandit understood this and so he asked Gaurasundara Mahaprabhu to reinitiate him. Mahaprabhu’s judgment, however, was that he should go to his own guru to hear the mantra again." The lesson to be learned here is this: Shrila Gadadhara Pandit Goswami is Mahaprabhu’s eternal associate; it is thus impossible that any contamination could have entered his mind. It was only through Gadadhara that He was instructing those who would be guru that if one instructs an unqualified person in the mantra, it loses its potency and no longer brings the same joy to the heart of the practitioner. When this happens, it is necessary to go to the guru again and hear the mantra from him again. It is against custom to hear the mantra again from someone who is not one’s guru, because one cannot change initiating spiritual masters in this way. Gadadhara was only saying "I cannot concentrate like before" (na sphure bhalo mati), i.e., "The ecstatic feelings no longer come when I chant", out of an exemplary humility designed to teach humanity how to act. On the Oriana Shashthi festival, Jagannath’s servants dress Him in a cloth which still has starch in it. Shri Pundarika Vidyanidhi was a pure sad-achari, i.e., attached to the proper etiquette of Vaishnavism. When he observed this custom, he did not feel happy about it and said to his friend, Svarupa Damodar, "Why do they give this unwashed cloth to the Lord? The people of this country know the rules in the Smritis and the Shrutis, so why do they give this mariuwa cloth to Jagannath?" Svarupa Damodar answered that the Supreme Lord is beyond the rules and regulations that have become general custom and that therefore there was no fault. Vidyanidhi did not find this conclusion satisfying and he countered by saying, "That may be true for the Lord Himself. But His servants should follow the rules of the scripture. The shri-vigraha of the Lord is beyond the material qualities, so you can say this of Him, but His servants are not of the same nature as He. So we have to judge whether their behavior is proper or improper." When he woke up in the morning, the Devotees saw the marks of the Lords’ slaps on his cheeks, which had swollen as a result and they started to laugh. This pastime shows just how dear Shri Pundarika Vidyanidhi was to Jagannath and to Mahaprabhu, for the Lord only comes to His dearest Devotees to personally punish them in this way. It is stated in the Bhakti-ratnakara that Mahaprabhu celebrated the birth of Radharani at Sri Pundarika Vidyanidhi’s house. (Bhakti-ratnakara 12.3177).